Our West Coast Brewery Tours group getting ready to roll out of Victoria! Our West Coast Brewery Tours group getting ready to roll out of Victoria! Earlier this month, a couple of us regular contributors to What’s Brewing magazine joined in the fun at the 5th Annual Victoria Beer Week: the BC capital region’s spring celebration of all things beer. Travelling to the Island from Vancouver, we arrived in time to take in the closing weekend of the 9-day event, spanning March 2nd – 10th, 2018. As I sped from BC Ferries’ Swartz Bay terminal with our Chief Photographer Brian K. Smith alongside, the upcoming weekend’s plans ran through my head. 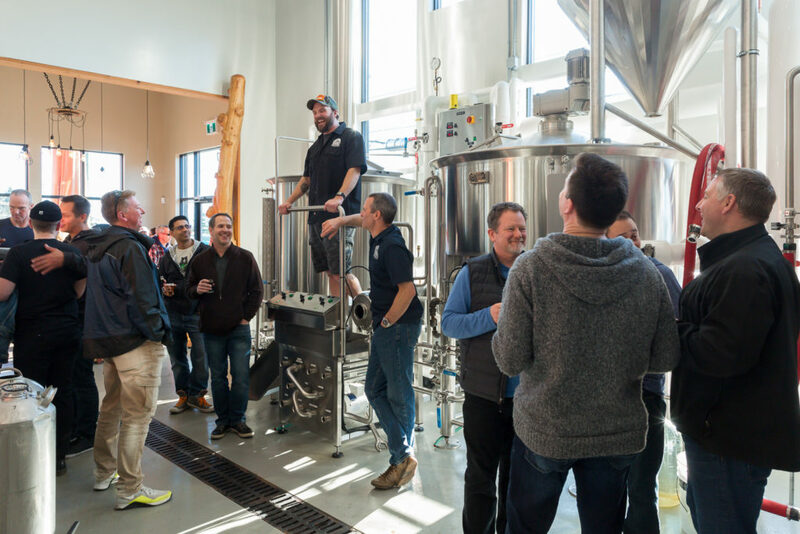 Foremost among them was the opportunity to visit a new hotbed of craft brewing in BC: the relatively tiny community of Sooke, on the southwestern side of Vancouver Island. Less than two years ago, there were no breweries there, but by 2017 a trio of brewing establishments had materialized seemingly overnight. My nose for beer discovery was twitching. 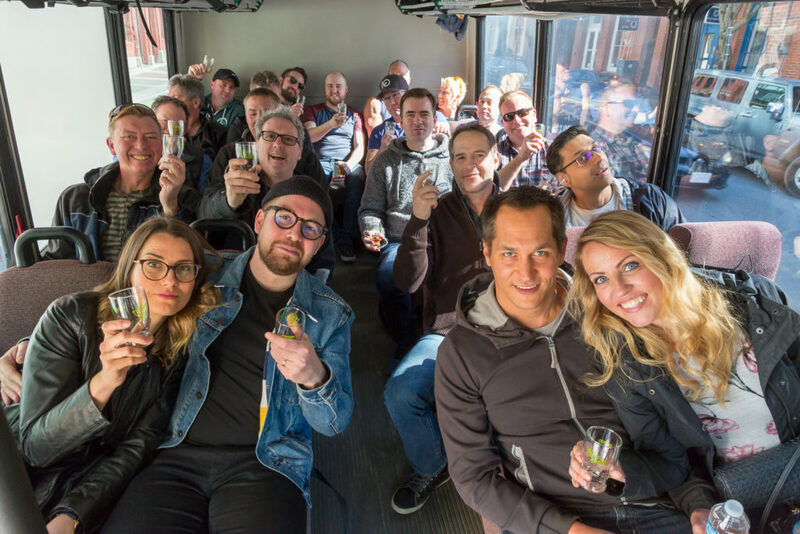 The idea of visiting Sooke was triggered by an invitation to one of the many events during Beer Week: The Sooke Beer Run, a bus tour hosted by West Coast Brewery Tours, was scheduled to depart from Swans Hotel & Brewery in downtown Victoria. As luck would have it, that’s exactly where Brian and I were staying (and it’s highly recommended), so when the time came we simply sauntered downstairs and met the bus. WCBT owner/driver Elton Walker rounded up the riders, and the motor coach set off for sunny Sooke. One of the gratifying things we’d learn about our visit to Sooke is that its three breweries offer completely different experiences. Of the trio, easily the largest is the namesake Sooke Brewing Company. When you approach their building, the amazing design and woodwork lend an impression of quality straightaway. Located right in the heart of town, this stunning food and beverage facility was years in the making. 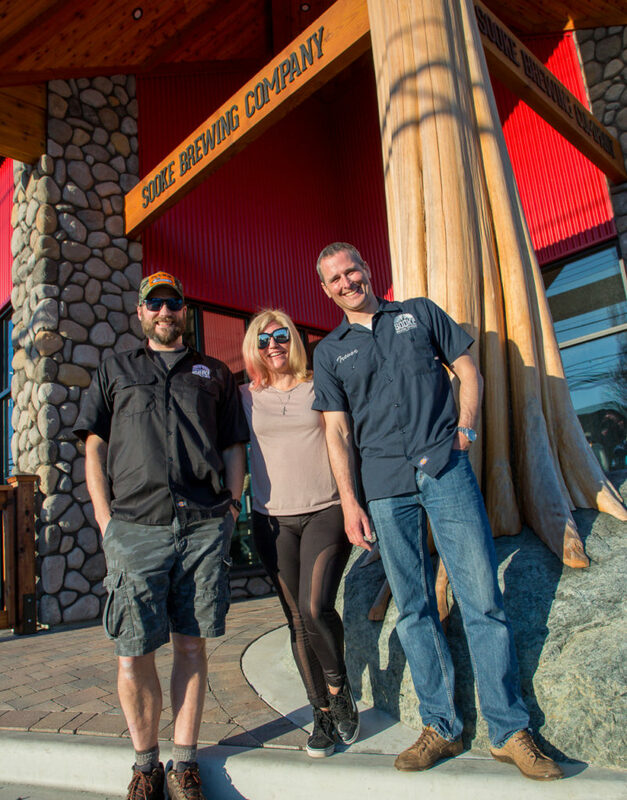 Sooke Brewing was created by a five-part ownership group, whose members provide complementary skills and attributes. One of the group, who happens to own a neighbouring business, took the lead in the building’s construction. Its large pillars feature eye-catching rockwork, as well as a monumentally imposing tree trunk set into a giant rock outside the front doors. With an exterior like that, expectations were high. The interior, sporting tables with live-edge wood surfaces, didn’t let us down. The tasteful taproom décor had a balanced feel (just one flatscreen TV, so one of the owners—and any like-minded guests—could watch their sports). Having visited countless breweries up and down the West Coast, I can tell you that the attention to detail both outside and in is right up to par with some of the most experienced organizations in this hospitality category. This is something to be proud of considering it was boostrapped by a group of locals. Yari Nielsen addresses the crowd in Sooke’s brewhouse. Of course, we weren’t there just to drool over the beautiful edifice; we were there to try their beer. Happily, the sizeable brewhouse was being put to good use, and owner Yari Nielsen gave the tour group a rundown of their process. We tried a few brews in their lineup, including a very nice Westcoast Belgian IPA. The brewhouse’s uber-clean floors are testament to the care that is going into their beer. As noted, when visiting the breweries in Sooke, you needn’t fear that you’ll be bored by the monotony of travelling from brewpub to identical brewpub. Part of the fun is meeting the people and finding out the stories behind each operation, and the evolving story underlying our next stop is a compelling example. Ryan Orr comes from an extensive hospitality background. A trained chef, he decided years ago that he’d eventually follow his passion for beer and open a brewery and restaurant with wife Karri. His intended target was Sooke’s beautiful harbour, home to prestigious hotels and resorts. He even registered a name: Sooke Oceanside Brewery. But lacking the millions of dollars his dream operation would entail, his ears were open when an opportunity arose a little way up the road. The owner of a local gas station and garage decided he’d like to lease out part of the building, and Ryan eventually took him up on it. 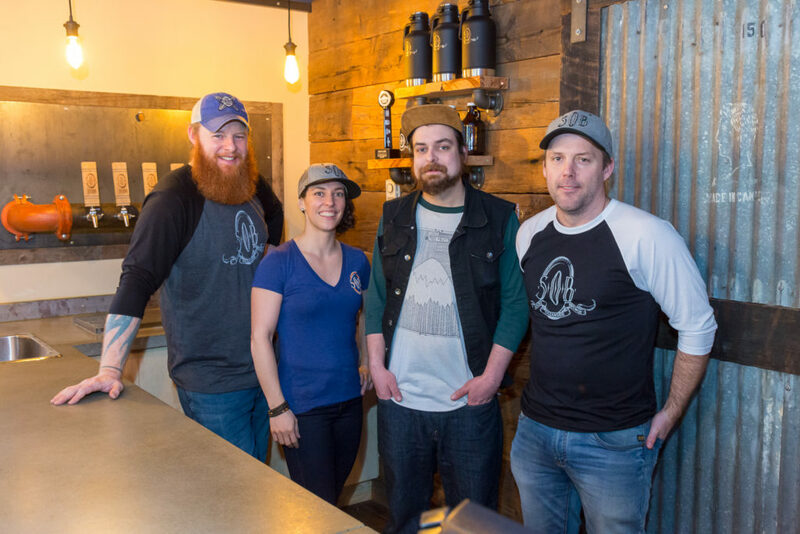 S.O.B., as the locals know it, has a two-fisted approach to brewing. At one level, they are a packaging brewery, with four core brands being bottled at a separate facility and available for sale around the region. Ryan originally thought that the Bonfire Blonde would be their flagship ale, but as it turns out, Renfrew Red is their biggest seller. Back at home in the garage, they keep it nimble with rotating beers available for growler fills, which make up the vast majority of their in-house sales. You can stop at the gas station for one kind of fill-up, then walk next door for the other kind. Brewer Garritt Lalonde is a jovial fellow who can be found participating in many a BC beer festival. He does a masterful job of coaxing delicious beverages out of the on-premises pilot system. When we were there, we enjoyed a great Scottish Ale that had just been tapped. Like many of BC’s small, independent breweries, they leave no impression that you’re drinking beer made in a place that’s much smaller than SBC. 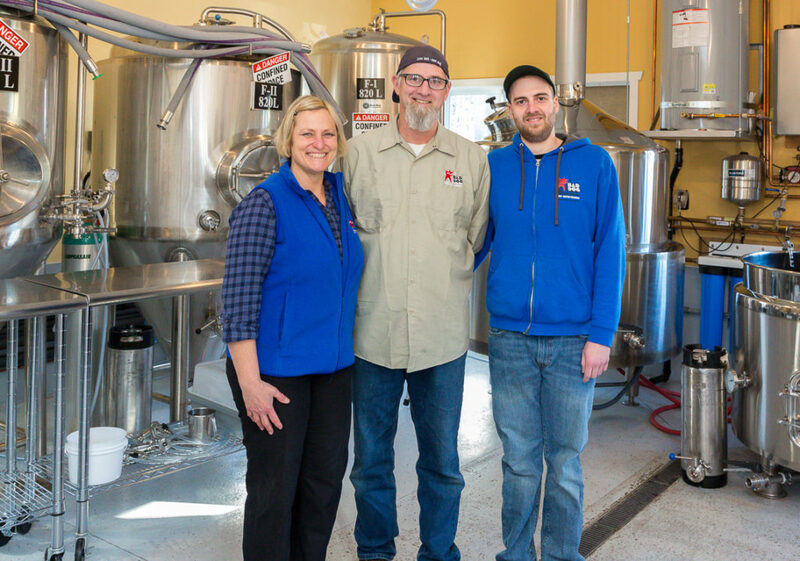 The Lyle family at Bad Dog Brewing: Rosanne, John and Paul (not pictured: other son Chris). As beer travellers, Brian and I have been to many outlets that offer the kind of down-home cozy intimacy you get at S.O.B. When you get out to Sooke’s third brewery, you get even closer to home than that, because once you step inside you are literally in their home. Bad Dog Brewing is set in the garage of the Lyle family residence, in a forested area just outside of town. A real Mom and Pop operation, this is a family affair with two sons helping. They’ve set up quite a tidy and professional sampling room where visitors can come in and try out what’s on tap. In the fridge are cans of their offerings, all sporting striking, colourful label designs. The beer was pouring well when we were there. We enjoyed the Honey Blonde Ale and Tire Biter West Coast IPA. Owner/Operator John Lyle has clearly put a lot of thought into what he’s doing. Brewing is not easy work, but the fact that the commute is pretty effortless makes up for it. Business Manager (and brewery Mom) Rosanne Lyle reports that customers are starting to sit at their grassy picnic area for a flight on nice days, and we saw evidence of that when we were there. Having an in-house brewery seems like the perfect option for this experienced, professional couple and their sons Chris and Paul. Other brewery options for before and after! Although the bus tour was focussed on Sooke, we took the opportunity to break away from the tour and do some additional exploring afterward. On the way back to Victoria, we had great food and beverage options thanks to two of BC’s long-established brewpubs, right along the way. After your Sooke run, pop in to Langford BC to visit Axe & Barrel Brewing, enjoy a meal and sample some of the ales on offer. Or, closer to Victoria and right on the Island Highway, you’ll find 4 Mile Brewing, where we dined on our way back, and it was a treat. Special thanks to Eric Sandberg and the team for the hospitality we enjoyed while at their establishment. Options to check out even more breweries on the way to and from Victoria! Plus: let’s not forget that great West coast scenery that we take for granted here in Beautiful British Columbia. We really enjoyed the opportunity to make our first visit to Sooke BC.